Ilyashev & Partners Law Firm was ranked among Top-5 leading Ukrainian law firms and has taken the 4th rating position according to the Ukrainian national survey “50 Leading Law Firms of Ukraine 2018”. With the team of 50 attorneys and lawyers working in 6 offices in Ukraine, Russia and Estonia Ilyashev & Partners occupies leading positions among Ukrainian law firms in terms of revenue and financial effectiveness. Ilyashev & Partners Law Firm has been a leader in the litigation practice by the number of judicial and arbitration disputes in recent years: in 2018 the Firm provided legal advice in over 40% of major public litigations and arbitrations. The Firm’s projects have also been included into the list of 10 major public litigations in Tax Law. 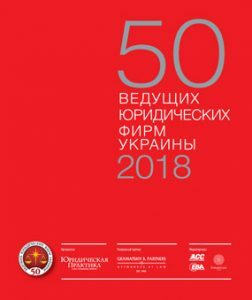 The Ukrainian national survey “TOP 50 Law Firms of Ukraine 2018″ was carried out by Yurydychna Praktyka Publishing House. The market leading law firms are ranked according to several criteria: number of lawyers employed, profitability, complexity of transactions and court disputes led by a law firm, financial performance. All figures are aggregated using weighted coefficients. Coefficients are correlated to integrate in the final table the financial results of the law firm, the scale of its practices and professional reputation.